We use this teaching method along with our philosophy of target language only in the classroom. So we expect that both teachers (and students) try to use the language that they are learning in the classroom as much as possible. Hills Learning incorporates FIVE language techniques in both group classes and private lessons. 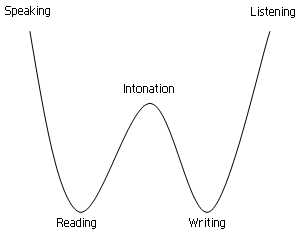 These techniques are Speaking, Writing, Intonation, Reading and Listening (SWIRL). We believe that these language techniques are indispensible to one’s language acquisition and production. At Hills Learning, we aim to offer a Highly Interactive Language Learning experience to students in both group classes and private lessons. Hence, our language lessons are structured into three tiers of focus. The top tier comprises of Speaking and Listening. In all our language classes, the focus of the classroom are the speaking and listening components of the language. We feel that these are the most important aspects of learning language, “to speak is to know.” It’s also been the most popular with our students, most students want to focus on communicating the language orally, whether it’s for travel, business, or personal enrichment. The second tier focuses on Intonation (Pronunciation). Please note, while we say “Intonation” we really mean Pronunciation. Although Intonation is important in tonal languages such as Chinese, Cantonese or Thai, pronouncing language correctly really determines your ability to get your point across. In Mandarin if you use the wrong tone you’ll say a completely different word. In phonetic languages such as Korean or Japanese it’s also important. The third tier of SWIRL comprises Reading and Writing. Although this is the bottom tier and thus least in importance, it’s important to say here “last but not least.” Our philosophy is that while the other language skills are ranked higher, you will never be fluent in the language without learning how to read and write it. This is a very important point because it's one of the most challenging skills to develop in our classrooms, and usually we assign students homework for reading and writing. It’s important to learn to how to read in all languages, because once you do you can learn to pronounce the alphabet (and eventually the language) correctly. You'll notice that this is the number 1 part of our philosophy, use the target language. This means NO ENGLISH in class. We truly believe that using the target language in class is the best way of developing ways to communicate in it. It's like learning an instrument, the only way you'll be able to play is to practice playing the instrument, and not discuss about how the instrument is played. The majority of our students are adults and therefore, some of us are self conscious about making mistakes, and not sounding sophisticated when speaking. This is not the mindset to have when learning a foreign language, the quicker people are comfortable making mistakes and just getting their point across, the quicker they will develop the confidence to communicate. While the Can Do Objectives are setup by Hills Learning mainly for the group classes, we do firmly believe in the power of goals and motivation. Always keep your objectives in mind when taking classes for learning language, and make sure you're taking steps to achieve those objectives. Most of our group classes take place only 1x a week. While we try to utilize that classroom time to have students speak and interpret that target language as much as possible, it is still only 1.5 or 2 hours per week. Previewing the next classes contents, doing homework assignments, and following your own self study methods are key to really developing your language proficiency. Hills Learning is a fully accredited institution by the Middle States Association of Colleges and Schools. What this means is a governing body has come in and observed our classes, facilities, administration, finances, instructors, and overall program and given us the distinction of being an accredited institution. Generally what this means is that the institution has a quality offering, meaning that our curriculum, teaching methods, assessments, and other parts of our program have been checked by experts in the field. It also means that we are a data driven organization, we have specific objectives that we have set for educational performance for our students and our teachers for the coming years. February 2015 - Candidacy Site Visit by Middle States Representative to Hills Learning. Multiple recommendations analyzed and condensed into one report for actioning. September 2015 - Accreditation Survey Conducted of all students of Hills Learning and employees. 100+ responses received. February 2016 - Site Visit by Middle States Association, two representatives came and interviewed multiple students, teachers and other stake holders of the learning center. The team also analyzed and commented on the accreditation report submitted by Hills Learning (200 page report). March 2016 - Visiting Team's Report Processed and sent to President for Approval. Recommendations taken under consideration by Hills Learning, but the conclusion by the visiting team is to recommend Hills Learning for accreditation. Technical Objective: By 2023, 75% of all students enrolled in a 12 hr class will increase their speaking (based on ACTFL) by one phase level. Data Points: Assessment grades from speaking assessments. Can-Do Statements issued in group classes, where students self assess themselves on each can-do statement at the end of the semester. Technical Objective: By 2023, 75% of all students enrolled in a 12 hr class pass their proficiency tests (70% or greater) Data Points: Assessment grades from proficiency assessments. Can-Do Statements issued in group classes, where students self assess themselves on each can-do statement at the end of the semester. Technical Objective: By 2023, Hills Learning classes will use target language only (90% or greater). Data Points: Class observations given by administrators, colleague teachers, and students in feedback forms. Technical Objective: By 2023, Hills Learning classes will have STT, or Student Talking Time, of (60% or greater). Data Points: Class observations given by administrators, colleague teachers, and students in feedback forms. Hills Learning prides itself on having multiple levels for all languages for its classes. We want to make sure that students will have enough curriculum in our classes to build speaking skills, and develop the grammar and vocabulary that is necessary for fluency. We also want to make sure that the label we give classes accurately describes student proficiency levels. We like to say that it's possible to take about 5 levels of classes a year with us. So in other words, students can take about 7 years of classes with us (in the group setting) that will reach through the top proficiency of an intermediate speaker with us. We then have another 7 years of advanced class levels. It is important to Hills Learning that in our curriculum we set specific goals for each level of class for students to achieve. In the group classes, we have five can-do statements that have been created per semester to facilitate learning and have a focus of the class time. It is used by teachers to focus their teaching time, but also for students to refer to and self assess themselves throughout the language classes. Although the can-do are generally for the group classes and follow the 12 hour semester schedule, they can also be applied to private classes. However we would also recommend especially for private lesson students to have their own goals and objectives in mind, and keep these in place throughout their lessons. At Hills Learning, for every class that we teach, lesson notes are emailed to the students. What lesson notes are are they are summaries, written by instructors, that go through what was covered in class, and any relevant assignments that are due for the next class. After every class taken at Hills Learning, the teacher will write down lesson notes. Please note lesson notes include any relevant attachments for the class, as well as any links to youtube or audio files. The lesson notes are then reviewed by administrators, and sent out to the students, usually by 2pm the next business day. Please note that the lesson notes are a permanent record. So although students will get a summary email of their lesson notes, they can also login to the Hills Learning online portal and view all of their lesson notes at anytime. It's a good record for students to keep track of what they're being taught, and any extra materials used in class that they'd like to keep for future reference. Hills Learning in all of our group classes provides assessments in the final class of the semester. This is actually an accreditation requirement that assessments are given, it allows us to collect data on student progress and teacher efficiacy in the classroom. More importantly however, we like to say that the assessments are given for the students. It's a good check to make sure that the materials you're learning are actually being retained, and it also gives a clear goal to study for in the end of the semester. What Kind of Assessments do you have? Hills Learning is a learning center focused on part-time language students. Most of our students are attending classes once a week after work hours or on the weekends. The assessments that we administer are designed to check progress and knowledge, but also not to be too difficult. We understand that most of our students are not full-time students, and do not have an abundance of time to study outside of classes (although it is important to note, we do expect students to study outside class time). #1 - Proficiency - (Reading, Writing, Listening) - Designed to be no more than 30 minutes, the proficiency assessment is taken on paper in the last class with your classmates. #2 - Oral - (Speaking) - The oral assessment is 5 questions that the teacher will ask each student individually. The goal of the oral is to encourage students to communicate and speak in the target language. Are these Assessments mandatory? What happens if I don't pass them? When you enroll in any group class, assessments are mandatory. What this means is if you do not take the assessment, you cannot move onto the next level. We need a record of your assessment scores before moving up to the next level. Just in case you know you'll be missing the last class, please contact us as far in advance as possible, and we'll arrange for a different date and time for you to take the assessment. It is important to note that even if you do not pass the assessments (get a grade below 70%), it is still possible to continue onto the next level. It is also possible, however, that a different level will be recommended. In the event of a score below 70% a discussion will be held between the teacher, administrator and student about the student's level and which class would be the best fit going forward. Beyond this however, you should feel open to reaching out to your teacher or a staff member about your feedback at any time. We like to think that we have a small, friendly community at Hills Learning and we want to encourage openness and transparency as much as possible throughout your learning experience with us.